Carbon Monoxide is a very dangerous gas, which is produced by burning fuels such as wood, coal, oil and gas. If there is a lack of oxygen in the area where the fuel is burning, instead of producing carbon dioxide, it produces carbon monoxide. This occurs naturally in some appliances such as gas boilers, but the gas is usually disposed of safely into the atmosphere. Carbon Monoxide is a colourless, odourless and tasteless gas which makes it impossible to detect when relying purely on senses and is highly toxic to humans and animals. The most common symptoms of carbon monoxide poisoning may resemble other types of poisonings and infections, including symptoms such as headache, nausea, vomiting, dizziness, fatigue and a feeling of weakness. Young children may be irritable and feed poorly. Some descriptions of carbon monoxide poisoning include retinal haemorrhages, and an abnormal cherry-red blood. In most clinical diagnoses these signs are seldom seen. Carbon monoxide can have severe adverse effects on the fetus of a pregnant woman and can cause damage to the heart and central nervous system of others if exposed to the gas for a period of time. 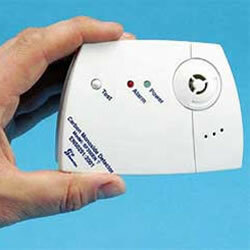 Carbon monoxide alarms are something to seriously consider installing or perhaps updating the one you have already. There are a lot of old unreliable CO detectors still out there for example; sticker patches that change colour. If you are one of these people then throw it away and buy yourself a battery powered CO detector and make sure the batteries are changed each year with a good quality high alkaline battery. If you are unable to purchase one or not quite sure on which one to get then we can arrange for one to be fitted for you on our next visit.